Also written 竜. Ch: long. A dragon. 1　Mythological animal and cosmological symbol of Chinese origin. The beginnings of dragon myths are obscure, but belief in such a creature predates written history. The image of the reptilian dragon as known today throughout East Asia had achieved its form by the 9c in Tang ink painting. Typically the dragon is covered with scales, has a long serpentine body with a scalloped dorsal fin, claw-like feet and pointed tail. Its face is distinguished by small horns, large eyes with bushy brows, flaring nostrils, long whiskers and sharp teeth. The dragon is associated with water, and is often shown emerging from vapor and clouds to produce rain. Living in the sky it is considered closely related to heaven, and from early times was used as a symbol of imperial power. In addition to serving as a deity of rain and of Heaven, the blue-green dragon seiryuu 青竜 is the directional symbol of the east, and thus one of the guardian animals of the four directions *shishin 四神. Dragons figure importantly in popular folk beliefs and Taoism, often serving as a vehicle for immortals. By the 9c the Chinese had incorporated the dragon into Buddhist thought and iconography as a protector of Buddhas and the Buddhist law. 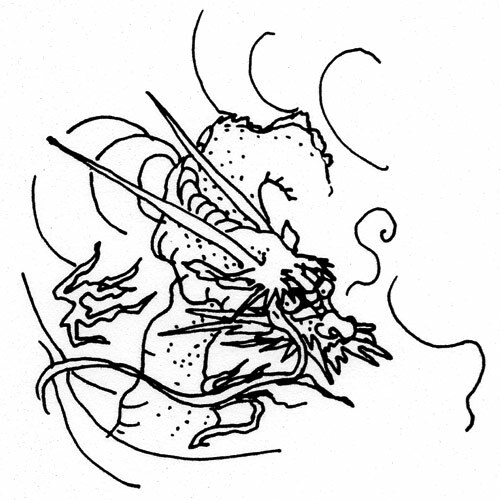 For example the character for "dragon 龍" is often found in temple names. The earliest representations of dragon like creatures are Shang and Zhou dynasties, bronzes and jades bearing abstract animal or monster designs. By the Warring States or Han dynasties, dragons were frequently painted on tomb walls to ward off evil spirits. Beginning in the late Tang period (9c), the dragon was painted in ink monochrome *suibokuga 水墨画. The so-called Nine Dragons hand scroll Kyuuryuuzukan 九竜図巻 (1244, Museum of Fine Arts, Boston) by Chen Rong (Jp: Chin You 陳容, act.1235-58) exemplifies ink painting of the subject in the Song dynasty. Large-scale dragon compositions came to be painted on the walls of imperial buildings and of temples. In painting for the Zen 禅 sects, especially, depictions of dragons and tigers *ryuuko-zu 竜虎図 were frequently paired. The famous ink paintings by Muqi (Jp: Mokkei 牧谿, late 13c) at Daitokuji 大徳寺, Kyoto, served as the model for countless later Japanese painted versions. Dragons came to Japan much before ink painting. Examples are found in handscrolls, such as Charicatures of Animals Choujuu jnbutsu giga 鳥獣人物戯画 and Kegon engi 華厳縁起. In Buddhist painting a dragon appears as the crown of the Dragon King Ryuuou 龍王, one of the *Hachibushuu 八部衆. Japanese dragon painting reached its apogee in the late 16c-early 17c paintings by Kanou and Kaihou artists, *Kanouha 狩野派, *Kaihouha 海北派. It is often suggested that these dragon paintings were intended as symbols of heroic leadership because the dragon calling forth rain is a metaphor for the enlightened ruler seeking able ministers. 2　Also ryuuou 龍王. Pre-Buddhist snake or dragon deities (Sk:Naga), adopted into stories of the Buddha's life and into texts honoring the Buddha and propagating his teachings. They live in water and have the power to control rain. In stories ryuu demand Buddhist treasures, especially relics, sometimes in exchange for quelling storms. In their kingdoms beneath the sea they guard treasures, such as jewels and Buddhist texts. Particularly when termed Dragon Kings ryuuou, they may appear independently in paintings, or they may be shown in groups or as attendants to Buddhist deities. When water is shown in a Buddhist painting, there will often be a dragon in it. Ryuu appear in the *Shouugyou mandara 請雨経曼荼羅, which was used in esoteric rituals for making rain. Individual ryuu include: Nanda 難陀, Bananda or Batsunanda 跋難陀, Sakara or Shagara 娑竭羅, Manasu or Manashi 摩那斯, and Zennyo 善女. There is also a group of eight dragons, the hachidai ryuuou 八大竜王, who are mentioned in the Lotus Sutra HOKEKYOU 法華経 and also appear in art. Nanda Ryuuou, who is one of this set, may represent the whole, as he does in the *Hokke mandara 法華曼荼羅. 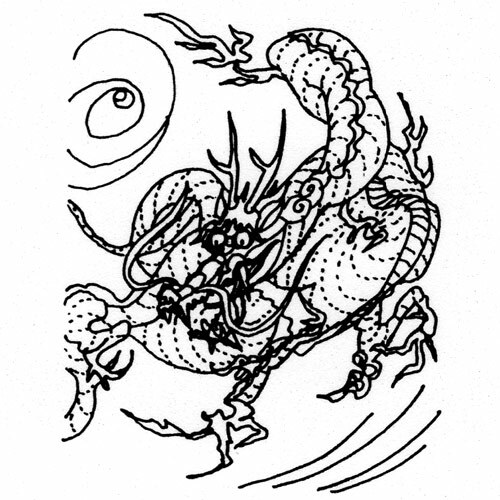 The ryuuou may be shown entirely as dragons, as humans with snake's tails, or as humans (usually in Chinese dress) with dragons or snake hoods or some other indication of identity. If multiple heads are shown, they may indicate the identity of the ryuu. Illustrations of the Lotus Sutra may show the Dragon Princess, who, in the Devadatta chapter, achieves enlightenment. Famous images of ryuuou include that of Zennyo Ryuuou 善女龍王 of Kongoubuji 金剛峯寺, Wakayama prefecture, painted by Jouchi 定智 in 1145, and that of Nanda Ryuuou 難陀龍王 (as a *honjibutsu 本地仏 of the deity of Kasuga Taisha 春日大社) of Hasedera 長谷寺, Nara, carved by Shunkei 舜慶 in 1316. 3　A type of bugaku mask *bugakumen 舞楽面. see *Ryouou 陵王.